Top day for all categories, plenty of winners, trifectas and even a couple of specials arrived. 14 outright winners at 35% is a great result. Should have been a good day for all. I am really looking forward to todays racing with some significant changes to track conditions around the nation. Although Randwick is still a Slow 6 , Eagle Farm, Caulfield and Morphetville have all been upgraded to Dead 4/5. A touch of rain in Perth has Belmont a D4 but there are plenty of showers around which could result in a downgrade to a D5 by race 1. If that happens start looking outside the square at Belmont. Not a bad days punting, specials only average but our best each way saluted the judge and was $13 on the fixed prices in early betting. Nice result. Tough day for winners with only 8 for the day but Trifectas and First Fours were great. It didn't help with the downgrade at Flemington. Specials were poor. Hope you found some winners. Welcome back and welcome back to the a Heavy track downgrade in Morphetville and Eagle Farm. More of the same for poor old Queensland. What happened to sunny one day , perfect the next? A good day for trifectas. Started well but finished slowly. Specials were poor. A horrible race meeting at Werribee should be avoided as they are all country standard maiden races specially on a H8 with 44 scratchings. Tread warily unless we get a run early that looks ominous. Remainder of the fields look good although Belmont will be a D5 or a S6 after some heavy overnight rain. A good day for winners and trifectas with 12 saluting the judge and 13 trifectas. Dissapointed in our specials with only 3 winners although plenty of them ran second. Early ratings have been posted and will be updated after scratchings tomorrow morning. Looks like a great days racing with plenty of specials so tune in. A very nice day with plenty of trifectas and 10 outright winners. Should have been 11 but we lost 1 on protest in Brisbane race 4 in Micken who was relegated to 4th. Specials saw 2 winners from 4 selections and 2 ran second. Good morning guys. I have just had a walk on the track and a discussion with the track manager and the lads doing the penetrometer. The Track manager is still going to go up a slow 7 but he is confident it will be slow 6 by race 1 or shortly after and it is going to race better than that. A peno reading of 5.5 suggests it will race in the dead range . The horses galloping on the A grass this morning went well with the riders commenting on the firmness of the track considering the rain early in the week. There was a heavy dew this morning which didn’t help but the sun will burn that off pretty quickly. It has not rained since last Tuesday morning so it is definitely on the improve. No guarantees that it will race well but I have a sneaky feeling the track will play ok today and all horses should get their chance. Don Ella in the 2 year old race is generous odds. Yes, she is still a maiden coming up against city class horses who have already won. She is bred to get 2 miles so the step up to 1500 should help her. I think she has a good level of ability, maybe we won’t get to see it today but she will have a future. Tiger Jet in the big rich maiden is the stables better chance on the day. I liked his first up run and he is better suited over the 1400 today. He has a good alley, prone to getting back in his races but from the good gate he should race handier and he can be right in the finish. Face Off is a stable newcomer. Has won on rain affected track but the connections don’t believe he does handle it well. Hes been in work for ages waiting for a dry track so taking a punt today on the track playing ok. He is a watch and see horse today. Thirsty For Blood is backing up from a gutsy win on the bog at Caloundra last week. She is fit and well but a query on how much that run took out of her. I like the step to the 1800, shes 10 bucks and I do think she can race better than the price suggests. Ballybit is a 2000 + mtr racehorse, hence the first up 1500 mtr race today. He will need the run and should take benefit out of whatever he does today. Griffon, a little disappointing last start but we have been happy with his work since. Looks well and can win if he turns up with his A game today. Funtantes, I ummed and arred a fair bit about running her after her two recent poor runs on wettish tracks. I am gambling the track will be dry enough for her come race time. Big decision in the last is in the same boat. Needs the track to dry out to be at his best. Can race well if the track gets into the dead range. Suspect otherwise. Smasher has had no luck at his last 3. Has talent and is good enough to win. Drawn well and the step up to 1400 can be a plus. Hes good value. Looks like a good day on the punt today with plenty of value around. Still looking for wet track form in Sydney, Brisbane and Adelaide. We have settled on four bankers today for our best bets and although short try an all up using some of the bankers into a value runner. All up the bankers and your getting 20/1 but they all must win. Another tough old day although Warwick Farm was good to us. The highlight was PR7/2 Totes Amaze which we had as our second rater drifted from 12/1 - $31 and duly saluted. Trifectas were very good with 12 and AR8 the trifecta paid over $2000. Our specials were unsuccessful with Leggy Blonde running an honest 4th and My Sabeel missing the start by 5 lengths, it was all over she cried. Breeding Chart for Turffontein Michelin Star filly. We have a share available in our Turffontein-Michelin Star foal born in August 2011 and ready to be broken in. 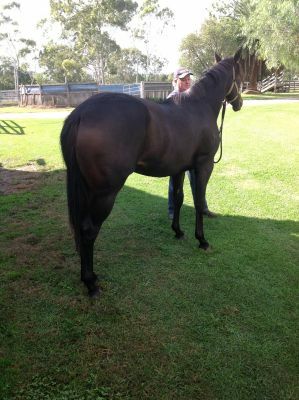 There is a 15% share available in this filly for $5000. The filly will be trained by Joseph Pride Warwick farm trainer who is currently fifth on the Sydney Trainers premiership and is the trainer of Rain Affair, Tiger Tees, Vision and Power, Red Oog all group winners. Joe is also a part owner of the filly. The filly will be broken in in July and then spend 2 weeks in the Pride stable to get accustomed to stable life. She will then be sent out to spell again and is expected to hit the race track early in 2014. The horse was to be sold in last years William Inglis sale in Melbourne but was found to have a floating bone chip and was subsequently withdrawn. She has shown no signs of soreness and it is expected the chip may have re attached which can happen with young horses. After breaking in and track work it is possible however that she may need to have the chip removed if it creates any lameness. It is not expected to prevent the horse from racing and as can be seen from the photograph she is a beautiful filly. The Turffontein foals that will be ready to race in August 2013 are showing plenty of promise with trainers who purchased foals at the recent sale and Anthony Cummings has a colt out of Maharani he reports has broken in perfectly and is doing everything right in his first preperation. Please email our site if you are interested in taking up an option and I will send you further details.